On virtually every indicator of individual and community health and well-being, people of color in the U.S. experience worse outcomes and more barriers to success than their white counterparts. Intervening to reverse these trends requires intention and attention: intentionality about understanding the historic and present-day manifestations of racism and attention to effective ways to intervene. Internalized—The set of private beliefs, prejudices, and ideas that individuals have about the superiority of whites and the inferiority of people of color. Among people of color, it manifests as internalized oppression. Among whites, it manifests as internalized racial superiority. Interpersonal—The expression of racism between individuals. It occurs when individuals interact and their private beliefs affect their interactions. Institutional—Discriminatory treatment, unfair policies and practices, inequitable opportunities and impacts within organizations and institutions, based on race, that routinely produce racially inequitable outcomes for people of color and advantages for white people. Individuals within institutions take on the power of the institution when they reinforce racial inequities. Structural—A system in which public policies, institutional practices, cultural representations, and other norms work in various, often reinforcing ways to perpetuate racial group inequality. It is racial bias among institutions and across society. It involves the cumulative and compounding effects of an array of societal factors including the history, culture, ideology and interactions of institutions and policies that systematically privilege white people and disadvantage people of color. It’s clear from this multi-level understanding, that we are far from the post-racial society that many would have us believe we are now witnessing. The history of race and racism have an enduring impact on current events and circumstances, and racialized outcomes are still in evidence, even if interpersonal racism and some aspects of institutionalized racism are waning. So, how can we think strategically about how to make lasting changes in the lives of individuals, families and communities? Understanding that racism operates on multiple drives us toward taking a systems thinking approach to addressing its impact. 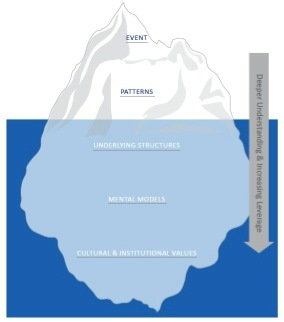 We used the systems thinking iceberg as a tool for understanding more deeply how race and racism affect our programming, goals and approaches, and for thinking strategically about where to intervene for the highest leverage impact. Systems thinking guides us to shifting mental models as the highest leverage way to change a system. That’s why work connecting unconscious bias and structural interventions by john a. powell and others is so important. And, it’s why it’s so important to make sure we have the people who are most affected by our work at the table when we design and evaluate it. Their voices and perspectives are essential to make sure we’re challenging both mental models and practices that hold inequities in place. Click Here to download the resource guide that support these design principles! What would you add to this set of design disciplines? What helps you to understand race and design your work in ways that leads to greater equity? how do these “design disciplines” play out for the nonprofits in your session? or others that you know of? how long was this session, 90 minutes or so? if so, how did you design the time together in order to move beyond just the diagnostics of these four layers of racism? how did a mixed race group feel at the end of this exercise? in my experience, it is rare when a workshop on race ends with people feeling invigorated or hopeful when we bite off the big pieces of institutional and structural racism. i find that we have to design spaces and conversations and non-verbal exercises in order for people to get beyond the same ol, same ol exchanges about race. frequently, such meta- conversations on race tend to leave people of color feeling angry and/or disempowered while leaving whites feeling guilty and/or shut down. we rely on our verbal communication to try and navigate the emotional and psychological layers of our humanity and our soul. our verbal skills are not up for such a tremendous task. Thanks for your questions and observations. I agree that it’s important to design conversations that enable folks to engage and think together without the typical detours and challenges. There is a lot of work to do to create spaces that are genuine and generative. As for the structure of the workshop, it was 90 minutes and honestly, I think I put in a little too much content for the time. Still, judging from the discussion during the session, the workshop evaluations and informal conversations afterward, folks enjoyed the experience and felt they got something they could use. They were mostly people who were already aware of how racims operates and working explicitly on these issues. So there weren’t many expressions of guilt, shame or denial from the group. For other groups, I find that exploring the levels of racism can actually be empowering for people who want to avoid a conversation filed with blame, shame and guilt. Sometimes that kind if straightforward, problem solving approacb can help. And, it’s certainly not the only thing that is necessary. A lot of times, folks need time and space to explore a combination of their own identities and how racism affects them, how racism manifests in the current context and the historical context. What have you found helpful? One good resource for starting a different kind of conversation, check out this YouTube video by Jay Smooth.